Gluten-free Chewy Sugar Cookies have a chewy center, crisp edges, and are rolled in sugar to make them sweet and sparkly. They’re perfect to enjoy year-round! 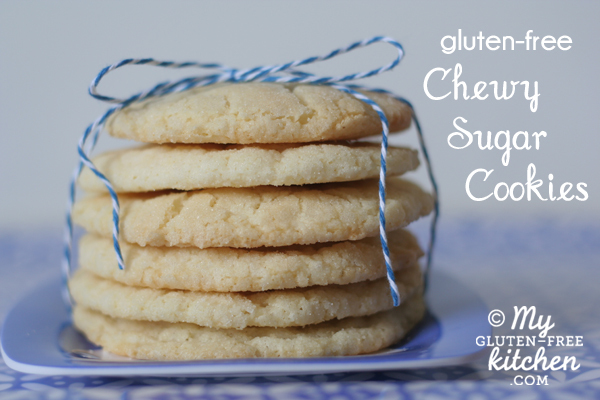 If you’ve been searching for a yummy gluten-free sugar cookie that is chewy in the center and crisp at the edges, then today’s recipe is for you! These delicious “drop” cookies are rolled in sugar just before baking, leaving you with a perfectly sweet, buttery cookie that won’t last long in the cookie jar! One of the best parts about making these cookies: you don’t even need a mixer! Just grab three bowls, a whisk, and a spatula and you are ready to mix! These are so much easier than roll-out cookies too! I just use my medium cookie scoop to scoop a rounded ball of dough, roll it in my hands, roll in the bowl of sugar, and place on my parchment paper lined cookie sheet. They bake in 13 minute or less! The recipe I adapted from for chewy sugar cookies is from America’s Test Kitchen. I’m a huge fan of America’s Test Kitchen. I DVR their programs (America’s Test Kitchen and Cook’s Country) from PBS, and watch them while I walk on the treadmill. I love how they spend many, many hours of research and many attempts to perfect a recipe. I usually have very little that I need to tweak in recipes I get from them. I really only adapted this for gluten-free by switching to a good gluten-free flour blend and adding xanthan gum. These gluten-free chewy sugar cookies are a drop cookie. No rolling out the dough for these. If you’re looking for a dough that you roll out and use cookie cutters to cut shapes out, then I recommend you make these gluten-free dairy-free cut-out cookies instead. Like most of my recipes, it has been tested with both of my favorite gluten-free all-purpose flour blends, gfJules and Gluten Free Mama’s Almond Blend. If you use gfJules, remember that it has xanthan gum in it already, so you won’t need to add additional in the recipe. If you’d like to make these dairy-free, just use melted coconut oil or another oil in place of the butter, and use a non-dairy milk alternative in place of the milk called for in the recipe. There are dairy-free alternatives to cream cheese that you can use as well. These changes will change the texture and how they spread or not a bit, but still enjoyable! The gluten-free flour, butter, and the temperature of ingredients will change how these turn out. They might come out thicker like the ones above, or thinner and more rounded on the edges like the one in this older photo below. Either way – so yummy! Plates of these delicious gluten-free chewy sugar cookies have vanished very quickly around here, so I can’t tell you how many days they stay great for. The longest we’ve had any left to consume was 2 days, and they were still perfect! Would you rather make bars instead of cookies? Try these gluten-free sugar cookie bars from Tessa at Salted Plains. They’re so fun and festive with the holiday sprinkles! Looking for some more gluten-free cookie recipes? You can’t miss these flourless chocolate mudslide cookies that are a new favorite! And my friend Megan has these gluten-free peppermint chocolate cookies that look amazing! 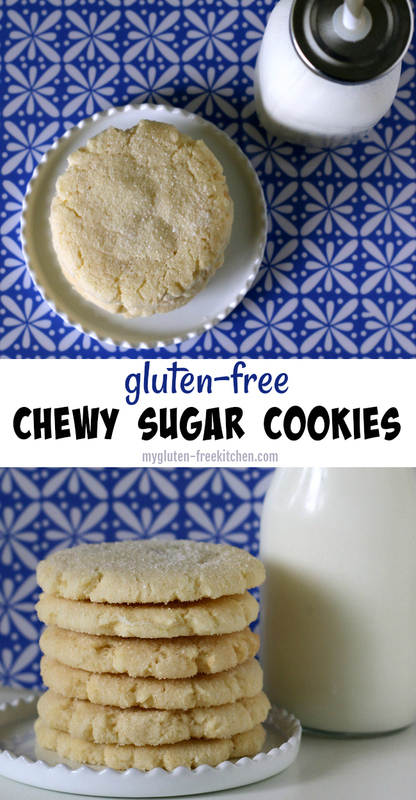 You don't even need a mixer to make these gluten-free chewy sugar cookies with crisp edges! Preheat oven to 350°. Line 2 large cookie sheets with parchment paper or silicone baking mats. Whisk flour, xanthan gum, baking soda, baking powder, and salt together in medium bowl. Set aside. Place 1 1/2 cups sugar and cream cheese in large bowl. Melt butter in microwave, then pour over sugar and cream cheese and whisk to combine. Whisk until there are no large lumps of cream cheese left. Whisk in the oil until well blended. Add the egg, milk, and vanilla; continue to whisk until smooth. Using a rubber spatula, stir in the flour mixture until a soft, homogeneous dough forms. At this point, I find it helpful to put the dough in the refrigerator for 15-30 minutes, so it isn't quite so soft to work with. Use a cookie scoop to scoop balls of dough that are approximately 2 Tablespoons in size. Measure 1/4 cup sugar into a small bowl; set aside for rolling dough in later. Roll the dough balls in the bowl of sugar. Place dough balls on lined cookie sheets, leaving adequate space between dough balls. I ended up with 12 cookie dough balls per sheet, and 2 sheets worth of dough balls, totaling 24 cookies. Using bottom of a drinking glass, flatten the dough balls until 2" to 2.5" inches in diameter. If you choose or forget this step, the cookies will stay domed, and will still be chewy, but softer. Sprinkle tops with additional sugar that is left over from the small dish of rolling sugar. Bake 1 tray at a time in a 350° oven for 11-13 minutes, or until the edges are set and just beginning to brown. Cool cookies on the cookie sheets for a few minutes, then gently transfer the cookies to a cooling rack. These really do taste best when they've had a chance to cool completely to room temperature so you can enjoy the crisp edges and chewy centers. As always, be sure to double-check all of your ingredients to ensure they are gluten-free. If your good quality gluten-free all-purpose flour blend contains xanthan or guar gum already, then omit the xanthan called for in the recipe. See blog post for the flour blends I've tested this recipe with. No wonder you have to do the treadmill, Michelle, with all these yummy treats around! 😉 Thanks for sharing this recipe – it looks divine! Vanessa- Thank you for coming back to rate and comment on the recipe! I love hearing from people that try my recipes! Enjoy! Have you any idea how well these might roll out and cut? Looking to do some gf decorated sugar cookies and am in search of a recipe that will hold its shape well. Beth, I wouldn’t recommend these for rolling and cutting. They just aren’t that type. They are a delicate, crinkly, chewy sugar cookie. I’m still working on getting the perfect roll-out cookie for decorating. I’ll post when I get it just perfect! Thank you so much for your reply. I look forward to that recipe. If I should happen upon a good gf roll-out sugar recipe, I’ll be sure to share. I have to make heart shaped sugar cookies for my daughter’s class party and she is allergic to wheat and oats. I LOVE your recipes and the mama’s coconut blend flour (thanks for the recommendation and for the awesome recipes!). 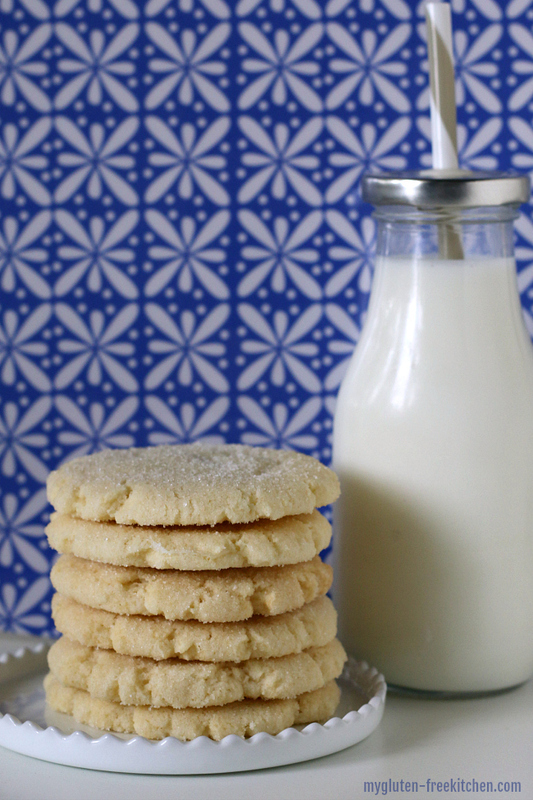 Were you ever able to find a good roll out sugar cookie recipe? I LOVE that you watch cooking shows on the treadmill. Me too. If that isn’t motivation, I don’t know what is. The cookies look great too! Nommmm. Wow!! Just discovered this recipe because I wanted to make christmas-themed sugar cookies for my coeliac boyfriend and they turned out AMAZING!! Didn’t roll out the dough in sugar because I wanted to add icing in the end but rolling them in more gluten free flour worked just as fine! Brilliant job! Thanks so much for sharing this! “These are amazing, Mom!” That’s all the confirmation we need sometimes! The first tray of 20 cookies was almost gone before the second tray came out of the oven. I’m envisioning holiday trays filled with these cookies, thinly glazed with lemon, dark & white chocolate, vanilla, etc., then topped with toffee chips, crushed candy canes, toasted chopped hazelnuts, etc., etc……… This cookie could be the basis for an awesome assemblage of holiday cookies! BTW, I use about 1:1 ratio of Pamela’s Pancake/Baking Mix and Pamela’s Bread Mix, no additional leavening or xanthan. You have me drooling with your description of using these for your holiday trays with those glazes! Mmmm! Thanks so much for your comment and including your tip about the flour/mix mixture you are using successfully. That really helps others that are wanting to try these. Hope you have a delicious holiday season! I hope you’ll have a chance to make these soon! Did you see that America’s Test Kitchen is coming out with a gluten-free cookbook in early 2014? I can’t wait! I just made this recipe gluten free yesterday and my dough was way to sticky! I was thinking it was because I didn’t have xanthan gum like you added or I needed more flour?! Any suggestions! I love ATK and was so excited for this recipe except my cookies ended up too big (my fault) and the bottom was more brown then I wanted. I will definitely make these again tonight with your adjustments! thanks so much! Yes, you definitly need to use xanthan gum or guar gum in these cookies (and really most all cookies, brownies, cakes, breads, etc.) So when you make them again, make sure you use that, and also make sure to chill the dough like I recommend in the instructions. That will make the dough easier to roll. Also make sure you are baking them on parchment paper or a silicone baking mat, as those both help prevent that browning on the bottom. Good luck to you in all your baking! Let me know if you have any other questions. I so want to make these! Can I substitute greek yogurt or something else for the cream cheese? So your greek yogurt might just work. Strain off any liquid and give it a try. Please come back and let me know how it works! My daughter’s classmate is having a cookie decorating party and I alllllmost RSVP-ed no, because where was I going to find a delicious GF sugar cookie recipe? Here! Thank you so much. We followed the recipe exactly (with the exception of subbing coconut oil) and they are perfect. I’m so glad that these worked well for you. I bet your daughter was thrilled to be able to go to the party and have her own cookie to decorate!! This comment makes me so happy! Thanks for letting me know that the coconut oil worked well in this recipe as well! Happy Baking! I made these the other day; I had half the batter left over and made the rest two days later and they still baked amazing. They taste great! 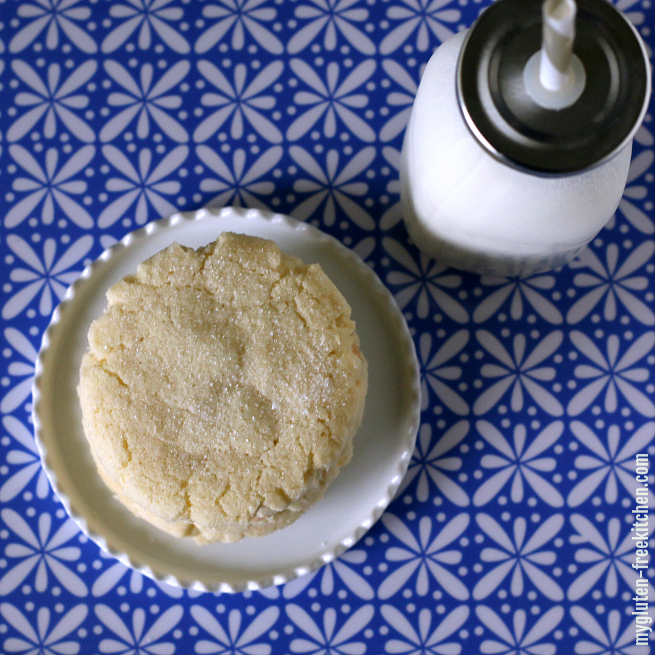 so much better than any sugar cookie recipe I’ve had that had gluten I was very surprised. Thanks for the recipe it is honestly amazing! Thanks for your sweet comment! I’m so glad that you loved these! I haven’t made these in a while and your comment makes me want to whip some up soon! Holly, that would definitely be worth trying! I haven’t tried it so I can’t say for sure, but I think it would be worth a shot. Those would be adorable! Thanks for your reply Michelle! I got 2 of these pans and will be trying it soon 🙂 Merry Christmas! Did you get a chance to try these out in your molded pans? I’d love to hear if that worked out well. Michelle these worked BEAUTIFULLY for me in the pans! I am SO grateful….you really saved the Christmas season for my family. The one Christmas treat my kiddos have really missed are good sugar cookies….thank you for sharing the awesome recipe! Has anyone substituted honey or maple syrup for the sugar? If so, did they turn out? What was the ratio you used? WHY OH WHY OH WHY, FOR THE LOVE OF ALL THINGS SLIM AND FIT, WOULD YOU POST A RECIPE LIKE THIS??????? They are wonderful. Hands down the best gf cookie I’ve ever had. Thank you very much for the recipe! Rachel, Your comment gave me a big smile! I’m so glad you loved these!! I made another batch of these about a week ago, and I will NOT admit to how many I ate each night, nor how much dough I ate! They are sure addicting!! So glad you enjoyed them too! Since going gluten-free (2 years now) I have tried all kinds of baking–usually having less than successful results. Just want to let you know that this is the BEST gluten free recipe I have ever encountered!! My daughter (also gluten free) ate two fresh from the oven and still warm and she normally will only nibble at my baked treats. I used my own flour mix AND divided the dough in half and added one and a half squares of unsweetened melted chocolate to one part. Then I scooped some of each doughs to make sort of “marble” cookies, although you could also easily make these into “black and whites”. No one could possible know that this amazing recipe is gluten free! Thank you so much! Does it make a difference what kind of milk (skim, whole, etc?) you use in this recipe? Thank you! I’m excited to try making these! I don’t think it would affect it too much, I wouldn’t use skim unless I had to though. I usually use 1 or 2% milk in it, whole would be great! I’m excited for you to try them too! Wonderful recipe! I whipped these up yesterday and they were gone before bedtime. We are dairy free so I thought i would share my substitutions in case anyone else may need them. I did a 1:1 substitution of the cream cheese for tofutti, and I replaced 50% of the butter with ghee, and added water for the other 50%. I also left the dough in the fridge for an hour to firm up the ghee. Simply the perfect cookie. Thoughts on using coconut flour? My 11 yr old made these under the direction of my mom. They were perfect! She even frosted them! Thank you so much for sharing this wonderful recipe. We will make these again. If you use a flour blend that already has xanthan gum in it do you need to add more? Paige! Don’t feel bad, I went according to the directions. I mean exactly and they came out a big slab of cookie too! So disappointed! I love this recipe!!! Can I make the dough a couple of days ahead of time and then use the dough? Dairy free success! I used so delicious brand vanilla yogurt instead of cream cheese in a 1:1 ratio. Instead of butter I used Palm shortening again in a 1:1 ratio. And lastly milk was substituted for ripple brand milk alternative energy a 1:1. I also used bob red mill all purpose baking gf flour. They were delicious. Chewy and soft. My husband could not tell they were “allergy” cookies. Hi! Can you sub the all purpose flower? I have almond flour, coconut flour, tapioca flour, and xanthan gum on hand.. debating what to use. Thanks! Awesome cookies!! I used Otto’s Cassava flour instead of a mix. They taste wonderful. Thanks so much for the recipe ???? Yikes……these are super spreaders! first try flattening to 2 inch round = 4 inch thin crispy cookie. Second try flattening to 1 1/2 inches, was still a thin round at least double in size. Final try was to leave it as a ball, not any better. There was also an oily feel to all the cookies, and oil spots on my silpat. Can this all be corrected by substituting shortening for the oil and some of the butter? This is the second GF sugar cookie i have tried, and the spreading is a big problem,. Hi, I tried to scroll through most of the comments to see if someone else has asked but there is a lot of them and there isn’t enough hours in the day to spend on things enjoyable 🙂 I was hoping to make these and them send them to a family member for a birthday surprise of sorts. One day shipping is ridiculously expensive though. Do you think they would be okay in a box wrapped in all kinds of parchment paper for 2 days of shipping. I’ve never actually sent food before so I don’t know if this is a thing that cookies would withstand. Do you have any experience with this? I thought if I put enough bubble wrap around them, they might come out the other end intact still. Thanks! Sorry I haven’t shipped these! I’d say give it a try! These are fantastic! My mom’s gluten intolerant, and my doctor is making me go dairy free for a while. I replaced the milk with almond milk, used extra veggie oil for the butter, and used cream of coconut with lemon juice for the cream cheese. The dough was a little powdery, but a quick mix with my hands fixed that. The cookies came out round and perfect. I’m so happy with this, it’s so hard to find allergen friendly recipes that actually taste and look good. Thanks so much for this!! !